After lots of reading and watching youtube-Videos i finally managed to set up my first Mining Rig. 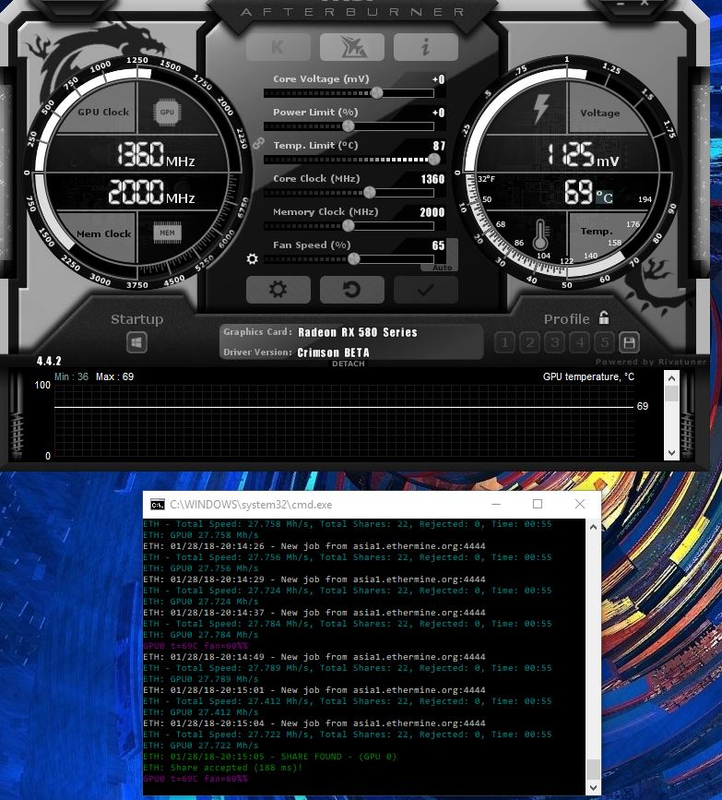 Took me about 50 Hours of Work to get them from awesome 18-20 Mh/s(Stock) to 31,0 MH/s with modded Bios + OC. So my Claymore-Performance is Average 31,0 MH/s ETH + 310 MH/s SIA-Coin. Power Consumption is 154 Watt per Card /From Wall (Including System + Monitor). All Cards have pretty much different Settings, some Finetuning can still be done for sure but for now i am happy. Please advice what the procedure to improve the hash rate for my RX580 Pulse 8g Samsung as for now it gives only 24.5Mhs. In stock I been able to get only 21Mhs and after in AMD GPU settings I changes the GPU to calculate the hash rate increased up to 24.5. In MSI AB I tried to play with CC and PL but didn't help as well as I tried to change the timing for 1750, 2000 and 2250. Really I would appreciate for your help or maybe someone else can advise how to improve it? How many times have you flash your video card? How many times can I flash a BIOS before showing errors? I see that everytime that I flash it, the address changes. So can you suggest your steps, to help a bit out? Greetings to the amazing forum !! @ liquidtroll If with Steps you mean Timings on GPU then just Use Polaris 1.6 it will change it automatically. Hi Luck0r, please advise if you have a right BIOS for RX580 Pulse for Samsung 8G. My rig currently has only two GPU: NVIDIA 1080 8G (not good choice for mining) & 1xRX580 8G Samsung. GPU: NVIDIA 1080 8G gives only 24Mhs and 1xRX580 8G Samsung now gives only 25Mhs. Also if you can share the BIOS and your Claymore config I really would much appreciate. And please advise how correctly I can measure my power consumption? Thanks a lot for your tips and wisdom comments. Hi there, I don't know if anyone linked the guide yet, but I stumbled upon this guide and it helped me to fix all the issues i had, even to lower power consumption. Check it out. Hi guys, can anyone help me out here? I just got myself 6x HIS RX 580 ICEQ X2 4GB hynix memory. Out of the box they hash 18 MHs. After pumping up memory to 2000 they hash at 20 MHs. I then mod the bios by copying timing from 1500 to all above it. But nothing happen. Hashrate is still the same. I'm using Windows 10 x64, Crimson Relive 17.9.3. Did I do the bios mod wrong? Nevermind, just found a solution. I remove the newest driver and install the crimson relive edition beta blockchain driver. Hashrate jumped to 29 MHs. 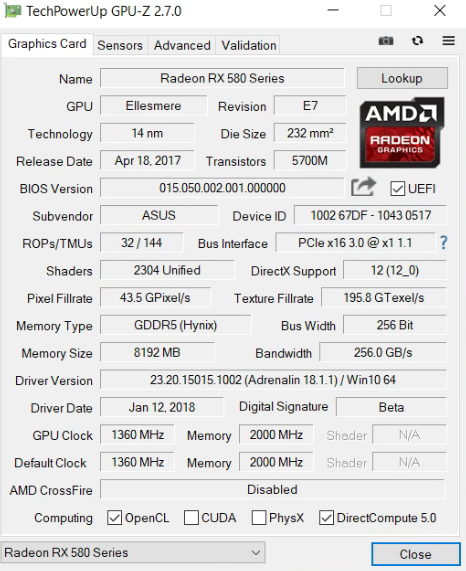 You could try newest Radeon "Adrenaline" Driver, activate "compute" Mode for every Card in Radeon Settings and try modding with Polaris 1.6 (It will do it for you). 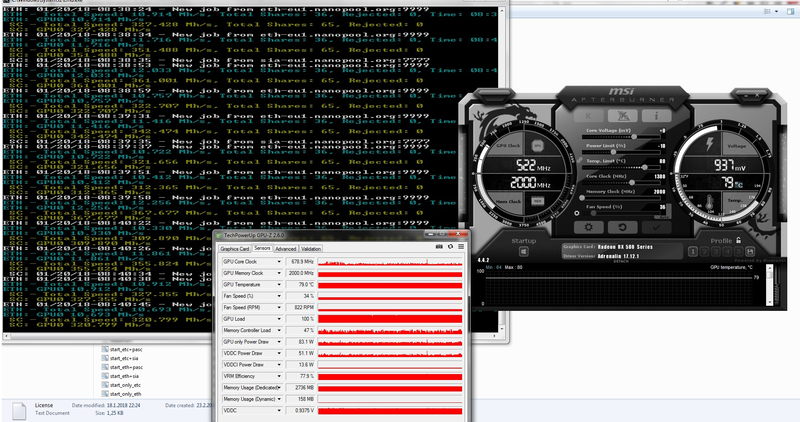 I have 4 cards giving me 29,2 and 1 giving 28,1.
i have build my 4th rig and i have some annoying issues with 2 GPUs. My cards are running on 29,3 MH/s and i am fine with that. When i start my ethminer all 6 cards run on 29,3 hashrate, but 2 GPUs start dropping slowly in their hashrate. And this finds its bottom at [email protected] ~23,5Mhs and [email protected] ~ 24,5 Mhs.... Total hashrate @ 164 ~Mhs. I have also tested everything with lower clocks, blockchain driver, older driver, and so on but always the same behaviour. Any suggestions? Yikes, I am adding 2 more RX 580's tomorrow... Hope I dont see the same. Is everyone running the same PCI risers (brand), cables, etc? Just thinking if there are variances. I agree, it would be easier long-term, but the Ethos was so easy to setup, and being a newbie, it made sense. But again, I have the Samsung memory and currently run at 27.2 on the Rx 580 8GB Armor OC and temps are nice and cool. I have Aorus RX 580 8GB Micron and have verry bed result. Can sombady have some suggest how ti fix this? What hashrate do jou have with the orginal settings and do you have your bios modded? Have an issue Im hoping one of you will be able to answer. Issue: Any changes on MSI AB is having 0 effect on hashrate. Currently getting 27.5mh. Aiming for 30mh. Testing 1 card in gaming pc atm as I will receive the rest of my parts for my first mining rig. Power and OC settings: Will post snap shots for different settings I have tried, but nothing seems to make a difference. Stock out of the box and installing the latest driver from radeon site I was getting 18mh. I then tried this driver labelled win10-64bit-crimson-relive-beta-blockchain-workloads-aug11 (17.30.1029) which is the current driver I have installed as it seems to be the only driver I have found that actually has any effect on hashrate. This brought my hashrate up to 24mh. I then flashed bios using ATIFlash v2.77 and polaris bios editor by Jaschaknack. This was all successful and brought the hashrate upto 27.5mh. Now I have installed MSI Afterburner. Which is where my problems lie. No matter what changes I make on that app it doesnt seem to change hashrate at all. I also have gpu-z to confirm settings are being changed. I dont understand why I have copied every other persons setup and not hitting 30mh with standard setup. And also why MSI AB is having no effect on hashrate. And I can have any variation in between and it makes no difference. Im stumped...so any brilliant people out there can help me with a solution will be eternally grateful. On side note. I returned everything back to stock and reinstalled everything again incase something went wrong. But this time I did the drivers last. Flashing bios on latest drivers didnt move from 18mh. Was only after I changed to that specific driver that it went to 27.5 again. Whereas first time after driver it went from 18 -> 24...Then flashed bios which went from 24->27. 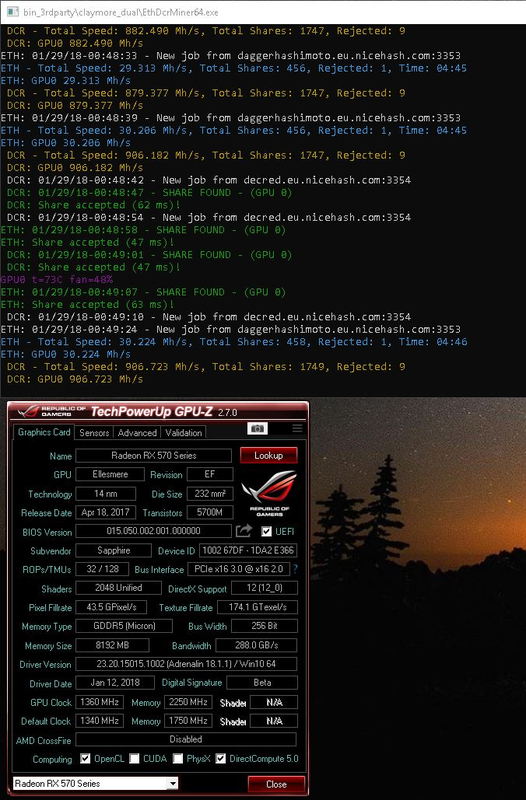 Posting screen grabs of gpu-z - Second image setup. Hello, Im new in mining (two weeks) and I have GPU RX 570 nitro + with micron memory. I red about flashing GPU for beter peformace, and I dont want to flash bios, befor I find someone to help me, because I heard a lot of damaging GPU if you dont flash GPU corectly. Sow... I made myself a test, without flashing bios. And I got 30.2 mhS/ETH and 908 mHs/DCR (dual mining) Power? 250 w from wall (55w is system, sow card is 195w). I know this topic is about RX 580.... But I want to post my resultats for your opinium-did I get a good job without flashin bios? And this would effectively change all 3 cards individually. However, i am having trouble tuning all 3 correctly. 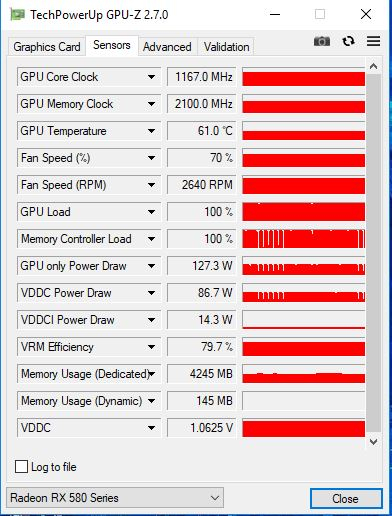 I found in this thread the "globalpowertune" option and by using "globalpowertune 5" i can get the hashrates show above, but with a bit of heat from card 3 (65 degree on PowerColor). If I try and tune each card individually along with the globalpowertune, clearly that doesnt work. So i can either use "globalpowertune 5" and stay the course, or remove tat line and tune each one individually, correct? £50 either paypal or eth transfer to anyone who can help me resolve the following. Oddly the highest I can get is with stock settings, averaging 17mh/s eth & 500 mh/s SIA. 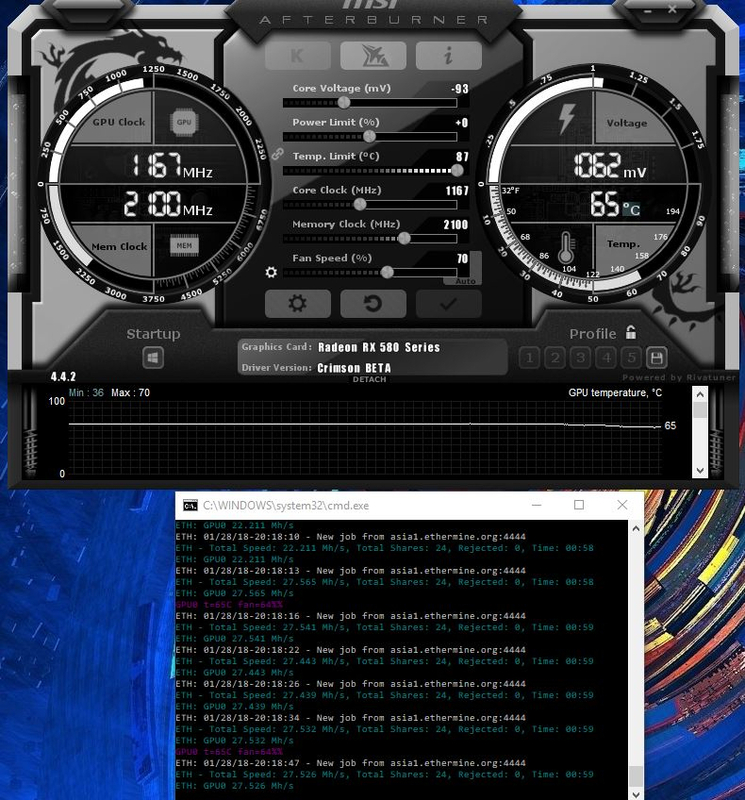 I've built a few rigs (1070s MSI) that all work as expected, these 580s are stumping me. I would be over the moon with 25mh per card at this point. You should try beta blockchain drivers. 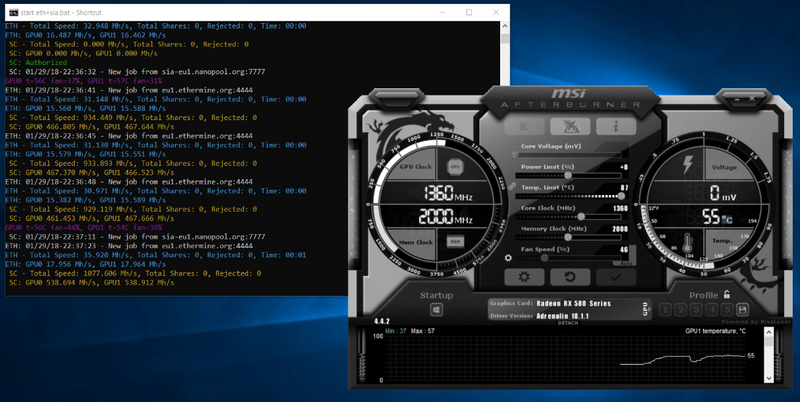 First clean uninstall drivers with ATI tool, then install amd blockchain beta driver. You should see some gain. And don't forget to change virtual memory to 16gig. I think you'll see changes. @KryptoCH thanks buddy, will report back in tomorrow. Very serious on the offer of £50 if I can get these up to at least 25mh/s per card. I flashed two cards with ATI and saw a jump to 20/21 mhs so that's something so far! For the drivers you have, go to radeon settings Gaming and choose compute for every card! i have a single 580 hynix/samsung and by using PBE one-click patching @ 1200/2100/875 I can only get it to hash 30 Mh tops mining eth. what clocks do you have here?